N13205 at Merrill Field with the Chugach Mountains in the background. More touch and go’s today. After last week, I was eager to get pack into the plane and try some landings without the added challenge of 17 mile per hour winds. We flew for an hour in the pattern and got in 9 landings. I found that it took me awhile to get into the swing of things, and I was even maybe a little disappointed that my touch downs didn’t go as smoothly as I had hoped. Nonetheless, I did pull off at least one pretty good one near the end, and I know that overall I’m showing improvement with each lesson. I continue to become more comfortable with my ATC communication, which was crucial today, since there were quite a few planes in the air today. Numerous times, the tower asked us to extend our climbout and/or downwind legs, and I had to keep my eyes alert looking for the other traffic in the pattern. My main learning curve today was that I kept coming in too fast on final, which meant that had to lose alot of airspeed during the last half mile. I need to watch the airspeed indicator as I descend though my turns to make sure that I’m hitting the right speeds on each leg: 90 on downwind, 80 on base and 70 on final. I did get much better at keeping my right hand on the throttle and my left hand on the yoke, even through the touchdown, I just need to refine my throttle control all the way through my descent. Also, still pulling up a bit too much on the flare. Getting better, though, just don’t quite have it down yet. It’s all a huge learning process, this whole flying thing, and landing is by far the hardest part. I recognize that it’s all slowly and steadily coming together, one piece at a time, and it will just take more practice to get comfortable with all the procedures of handling an aircraft. To put things into perspective, I didn’t become a good mountain biker or rock climber in just one month. I’m in this for the long haul, and the learning part is an essential, important part of this process. I just need to keep that in the forefront of my mind as I move forward. 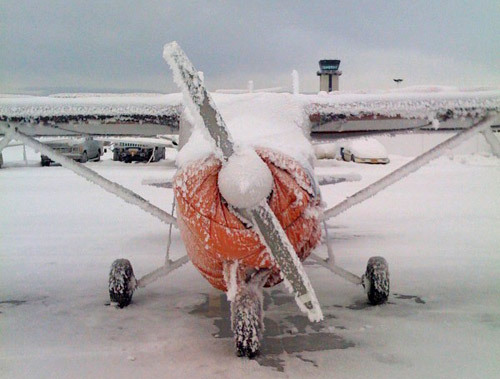 This entry was posted in Flight Lessons and tagged ice, N13205, snow, touch and go's. Bookmark the permalink.